The committee appointed to oversee the project and member included the Chairman of the Court of Governors, Sir Josiah Stamp (himself a statistician), Professor Theodore Gregory and the School Secretary, Jesse Mair. In May 1936 a letter was published in The Times, Daily Telegraph, Morning Post, News Chronicle, Daily Herald, Nature, and The Economist and by May 1937 the fund closed with £220 donated by 127 subscribers. The list of subscribers does not survive but the files mention a donation by the economist JM Keynes. 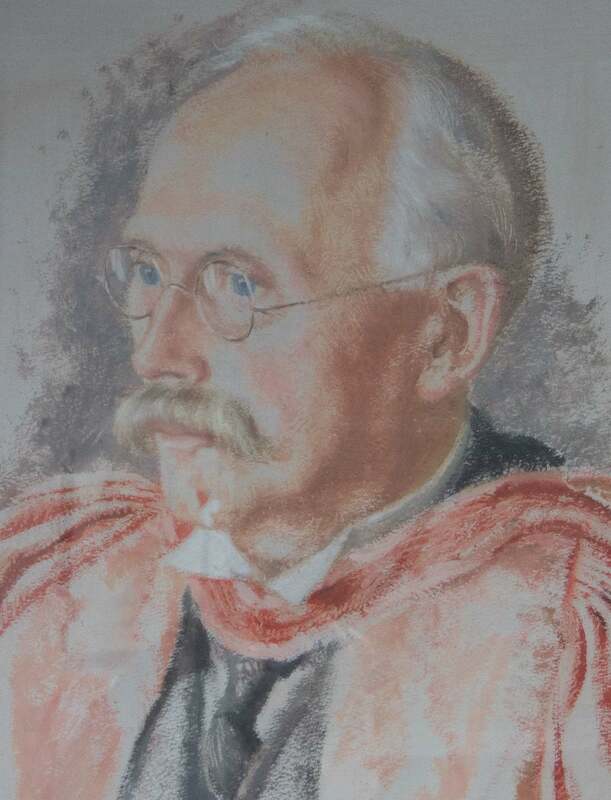 The committee agreed to commission a second portrait of Arthur Sargent, Professor of Commerce, who also retired in 1935 and to establish a scholarship in honour of Bowley. In July 1936 the School commissioned the Australian artist, Stella Bowen, to paint both portraits. Bowen was born in Adelaide, Australia, and moved to England in 1914 to study at Westminster School of Art. In 1918 she met the writer Ford Madox Ford and in 1920 their daughter Julie was born. The couple moved to France in 1922 but Bowen and Ford separated in 1927 and Bowen supported herself and her daughter with portrait commissions and journalism. There are no surviving details of Bowen’s selection as artist but she was a friend of the leading Fabian, Margaret Cole (1893-1980) and her portraits of Margaret and her husband George (GDH) Cole (1889-1959) hang in the National Portrait Gallery. She also knew the author Katherine Campbell Chorley, the wife of Professor Chorley, Sir Ernest Cassel Professor of Commercial and Industrial Law, and the School files indicate that Katherine Chorley passing on various School communications. By September 1936 Bowen had requested addresses for Bowley and Sargent as she wanted to include the portraits in an exhibition of her work at University College, Oxford, where GDH Cole was a Fellow. Bowen worked swiftly using a technique of oils on cardboard initially developed for children’s portraits. She could complete a portrait in two to three days which proved useful in her later career as a war artist. On the 3 November 1936 Stella Bowen was wrote to Jessie Mair after the close of her exhibition to arrange delivery of the portraits which were hung in the Founders Room (Shaw Library). In January 1937 Bowen arranged to check the colour of the frames as they did not match others in the room. Bowen was paid 40 guineas for the two portraits. Sadly LSE was not prompt in paying its bills and an undated note from Professor Chorley requests swift payment as Katharine Chorley knew that Bowen was worrying about paying her daughter’s school fees. During the Second World War the BBC’s Pacific Service commissioned Bowen to broadcast on her war experiences for an Australian audience and in 1944 she was appointed as an Australian war artist. After two initial portraits Bowen was based at RAF Binbrook in Lincolnshire painting the Royal Australian Air Force based in England and one of her best known works is Bomber Crew 1944 now in the Australian War Memorial. Stella Bowen died in 1947 of breast and liver cancer. Today Stella Bowen’s portrait of Sir Arthur Bowley hangs in the Leverhulme Library in the Department of Statistics. I was pleased to note that the committee that decided to collect funds for the portrait of Sir Arthur Bowley also decided to set up a scholarship in his honour. I suppose that was the source of the award of the Bowley Prize, a small, but very welcome, sum that I received in 1948 based on my (very mixed) performance in the ‘Intermediate’ exam taken at the end of the first year undergraduate BSc(Econ). The exam did not include a Statistics paper, and although I continued take some further Statistics for Finals, it was never a topic in which I shone. It was a very welcome boost to the confidence of a student who was struggling, particularly in mathematics, having left formal education at 16.